Ground Penetrating Radar Systems, LLC. 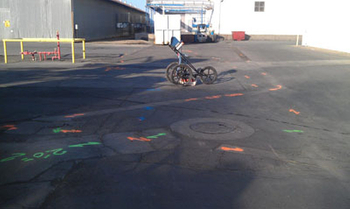 performed a utility and sub-surface anomaly survey for a large contractor in Fresno, California. GPRS used ground penetrating radar to locate multiple sub-surface water, power, sewer and data lines among other things. This information helped the contractor in making the decision on where to run there trench line. Ground Penetrating Radar is a great tool to scan areas of post tension cables, rebar, and conduits prior to core drilling, drilling for anchor bolts, saw cutting or trenching for utilities. The concrete imaging process is entirely nondestructive and free of radiation or health hazards. Please contact Ground Penetrating Radar Systems (GPRS) to learn how we can assist with your project. To locate rebar, post tension cables, conduits, pipes or utilities in concrete please contact us today. GPRS has offices throughout the entire state and performs GPR scans throughout the entire state, including cities like Los Angeles, Irvine, Glendale, San Diego, Riverside, Simi Valley, Pasadena, Torrance, Orange, Fresno, Modesto, Bakersfield, San Francisco, Oakland, San Jose and Sacramento. Please contact GPRS at (916) 539-6492 to learn more about ground penetrating radar and how GPRS can assist in your projects.